With 1911s like this Kimber ULTRA TEN II, many more parts can be switched because the manufacturers build numerous models with multiple options. One recurring question in IDPA is what parts may or may not be changed on a competitor's gun and why. The rule is that you can use those parts that the manufacturer will supply or has supplied for other purchasers on the same-model gun. The original intent of the rule was an attempt to ensure that all guns are competitive within a division without the need for modifications, that is, that a stock factory gun can be and is competitive. Next, IDPA wanted to ensure that no one gun, or no one or more "trick" modification, became the base line of competition in any division--a "you gotta have this or you're just not with it" situation. This perception and thinking is what happens in many sports. For example, the Practical Pistol Course (PPC), developed as a trying vehicle for police, began as a competition with the same guns, but pretty soon you had to have a 6-inch, heavy-barrel, adjustable-sight, action-tuned wheelgun to do well. IPSC began with standard guns and now is the home of both heavily modified scoped and iron-sighted guns and all 1911-style pistols. You either fork over $2,000 for a custom gun, or you are seen as (and you begin to think you are) uncompetitive. Fortunately, IPSC is coming full circle--there is now a separate division for factory guns. Of course, this is perception, not reality, for the best shooter is going to win regardless. 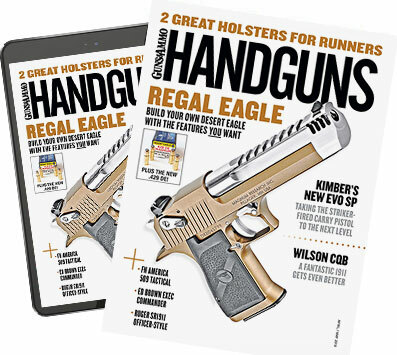 But allowing indiscriminate parts modifications and changes leads, inexorably, to an arms race that would push out the IDPA member who wants to be part of the "real practical shooting sport." The extended magazine release on the Glock 34/35, shown here, is legal on the Glock 17. If you have this overwhelming compulsion to change parts, check with the manufacturer and see if the part was used (or not), as described above, for your answer. IDPA is about real guns, not tricks. The extended magazine release on this LTT Custom Beretta Elite cannot be used on other Beretta pistols in IDPA competition. Editor's note: The author's opinions are his own and are not the official views of the directors or officers of IDPA. For more information or to join IDPA, contact the International Defensive Pistol Assoc., Dept. HG, P.O. Box 639, Berryville, AR 72616; (870) 545-3886; fax (870) 545-3894; e-mail: IDPA.org@yournet.com; website: www.idpa.com.